Here's an easy homemade date squares recipe just like grandma's! I love classic simple homemade dessert recipes. Give me old-fashioned Date Squares just like grandma's any day over fancy multi-tiered desserts prepared by the finest pastry chefs. I love home style baking best using familiar time tested recipes, usually from mom or grandma's recipe cards, like a recipe for Date Squares. What could be better than a good old Date Squares Recipe for making delectable fruit and nut filled oat-crusted date squares just like grandma's? You'll feel like you're back in her kitchen as you stir together dates, water and sugar for the filling, pop the pan of date squares into the oven and wait for them to finish baking, smells of dates, oats, and brown sugar filling the air. I think I love baking for the comforting smells, as much as for the delicious tastes. 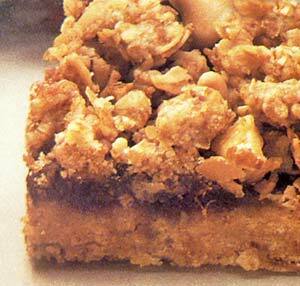 Date Squares are a great tasting treat anytime day or night. I love to serve them as a rustic home-style dessert following a casual family dinner, when enjoying coffee with a special friend, and I've even been known to indulge in date squares for a quick and tasty breakfast treat. Since they are filled with nutritious dates, nuts, and oats, serving date squares for breakfast seems acceptable some how and it goes without saying that they would be perfect on a buffet brunch table. Preheat oven to 350F degrees. Lightly grease a 9x13-inch baking pan with cooking spray. Make the filling by combining dates, sugar and (1 1/2 cups) water in a medium saucepan and cooking over medium-low to medium heat until thick. Remove from the heat and add walnuts and vanilla. Prepare the crumb crust by combining flour, salt, baking soda, rolled oats, and brown sugar in a medium bowl with a fork or whisk. Cut in butter with a fork or pastry blender until the mixture is crumbly. Add (1 tablespoon) water and blend in lightly. Press half of the oat crumb mixture into the prepare pan. Spread the prepared date filling on top of the oat crumb mixture to within 1/4 inch of the edge of the pan. Top with the remaining oat crumb mixture, patting it down lightly. Bake the date squares for 35 to 40 minutes or until lightly golden brown. Cool completely on a wire rack before cutting into squares, bars, or triangles. This recipe makes about 36 date squares. Would you like to try these squares with other dried fruits instead of dates? Go ahead. This recipe is flexible. You can use raisins, dried cranberries, or chopped dried apricots instead of dates. For an added flavor boost, add 2 tablespoons of a coordinating jam to the filling. For an extra special homemade dessert treat, serve these date squares warm with a dollop of freshly whipped cream or a la mode with a scoop of creamy and delicious vanilla or dulce de leche ice cream. Here's a cookie bar that's a good traveler. It's easy too because it all starts with yellow cake mix! Preheat oven to 350F degrees. Lightly grease a 13x9-inch baking pan. In a large mixing bowl, combine all base ingredients, except egg, and beat with an electric mixer on low speed until crumbly. Reserve 1/2 cup crumb mixture for topping. To remaining crumb mixture, add egg and mix until well blended. Press mixture evenly into bottom of prepare pan. Bake at 350F degrees for 12 to 15 minutes or until edges are light golden brown. In a medium saucepan, combine all filling ingredients, except lemon juice. Cook filling mixture over medium heat, stirring occasionally, until thickened and water is absorbed, about 5 minutes. Spread filling in an even layer over the base. In same large mixing bowl, combine 1/2 cup reserved crumb mixture with topping ingredients and mix well. Sprinkle topping mixture over date filling layer and press down lightly. Return pan to oven and bake 10 to 15 minutes or until top is lightly browned. Cool completely on a wire rack before cutting into bars or squares. This recipe makes one 13x9-inch pan of Cake Mix Date Granola Bars. A super-easy recipe for pecan date bars that starts with cake mix! Preheat oven to 350F degrees. Lightly grease and flour a 13x9-inch baking pan. Place cake mix in large mixing bowl and cut in margarine with Pastry Blender until crumbly. Add egg white and stir well (mixture will remain crumbly). Pat mixture into bottom of prepared pan. Combine dates, pecans and water in medium saucepan and bring to a boil. Reduce heat and simmer until mixture thickens stirring constantly. Spread date mixture in even layer over crust. Once cool, dust with confectioners sugar and cust bars into desired size. This recipe makes one 13x9-inch pan of Pecan Date Bars.